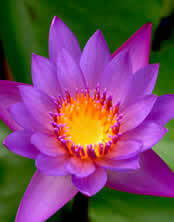 Spiritual living is a state of mind and can be done anyplace, anytime. Simply be at peace, quiet the mind, and be the truth that you are in everything you do. Darshan = Blessing from a Master. Nature darshan from Mother Earth (Gaia) is the most powerful darshan you can get. Gaia Sagrada does not handle airline reservations, nor can give you prices for that, but if you go to sites like www.priceline.com or www.kayak.com you will find the information you need. Fly into either Guayaquil or Quito international airports.However, we advise against using Quito as a landing spot because the airport is problematic in that where it's new location is going to be (and it's due to open soon) is an hour north of Quito, taxi fares to Quito for a hotel will be immense, and then you would have to go back the next morning. Also, Quito flights usually come in too late for connecting with a flight to Cuenca right away. You would have to deal with staying overnight in Quito, and there will be no hotels near the new airport. We suggest flying into Guayaquil, rather than Quito, international airport. The Quito airport is problematic in that where it's new location is going to be (and it's due to open any day now) is an hour north of Quito, taxi fares to Quito for a hotel will be immense, and then you would have to go back the next morning. Also, Quito flights usually come in too late for connecting with a flight to Cuenca right away, so you would have to deal with staying overnight in Quito. We suggest flying into Guayaquil even if it costs a few dollars more because you will save yourself a lot of time, energy and money once you land and have to deal with getting to Cuenca. Also, flights seem to come into Guayaquil earlier in the day, thus leaving you enough time to catch a flight to Cuenca. If you come later in the day and there are no more flights, you also have the possibility of catching a van to Cuenca (3.5 hr drive). If not those options, there are hotels near the Guayaquil airport that are reasonably priced. We recommend flying into Guayaquil rather than Quito. It is a good idea to arrive a day early (Thursday) before the retreat starts, just in case you can't catch a connecting flight for some reason. Try to book a flight that gets to Ecuador in the morning or afternoon so you don't have to stay overnight in Guayaquil or Quito. That way you can get a flight right away to Cuenca. The last flights to Cuenca from either airport leave around 5:30 or 6 pm, arriving in Cuenca at around 6:30 or 7 pm. If you plan to fly to Cuenca from either city, then it doesn't matter which one you fly into as long as you can land in the airport early enough in the day to catch a flight to Cuenca. Both flights are rather short, 30 - 45 minutes. Guayaquil is only slightly cheaper than Quito to fly to Cuenca from. You can buy a one way ticket to Cuenca if you don't know when you are planning to leave. It won't save you money to buy a round trip ticket. Tickets are approximately $60 - $80 one way. 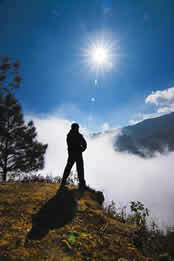 There are flights to Cuenca from both Quito and Cuenca on LAN, Aerogal or Tame airlines. We have found that LAN is the easiest one to make reservations with online. You can make a reservation online or by phone. Here are the three major airlines in Ecuador that fly to Cuenca from both Quito and Guayaquil. We recommend using the Guayaquil airport if you will have a lot of baggage or are traveling with others who can share a van with you, as this will save you money. Guayaquil is only a 3.5 hour drive from Cuenca, whereas Quito is 8 hours. A bus or van from Quito is grueling and long. We don't recommend travelling by land from Quito unless you are sightseeing along the way for a few days. Ask for the van services when you get out of the baggage area in Guayaquil. They are usually right outside the airport or will be every couple hours. You can catch a van to Cuenca without a reservation but if you don't speak Spanish you will need help. If you want to make a reservation, it's pretty hard by internet and long distance. If you want us to have someone make that reservation for you, it will cost $5 for that service. If we make the reservation for you, though, it is more likely your reservation will go through and you will have someone waiting for you outside baggage to guide you to the van. A van will cost approximately $15 to $20 from Guayaquil. 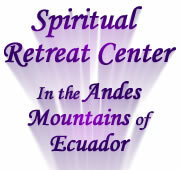 This ride is about 3 - 4 hours long and you will get to see some great countryside in Ecuador. Gaia Sagrada charges $5 to set this up for you (someone has to go to the city from here and pay them for your reservation in cash to make sure your name is on the list). Keep in mind that coming to Cuenca by plane might be better for you if you get carsick on curvy, mountain roads. It is not necessarily an easy ride. A plane is only a half hour ride from Guayaquil, but a van will take 3 - 4 hours. We can have a driver waiting for you at the Cuenca airport with the name Gaia Sagrada on paper as you come out of baggage claim. 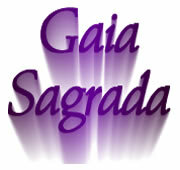 This driver will bring you to Gaia Sagrada Spiritual Retreat Center. 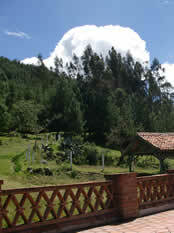 Gaia Sagrada is 45 - 50 minutes northeast of Cuenca from the airport. This ride will cost up to $25 if you are by yourself, less if you are sharing the ride with others. Gaia Sagrada charges $5 to set up transport from the airport to Gaia Sagrada. Disclaimer: There are no refunds, transfers, or cancellation reimbursements if you cancel for transportaion in less than 30 days. It is irreversible because we cannot retrieve the money from the van company or driver. Can I save money if I take a bus? Buses to Gaia Sagrada are complicated, impossible to explain, and often are standing room only. This is not a good option for your first trip to Gaia Sagrada while carrying luggage and being vulnerable as a tired traveller and newcomer to Ecuador. We do not recommend it. Try the buses on a day you have time to be adventurous, ready for the unexpected, and you don't have a lot of stuff with you. Unless you have only a daypack and are willing to stand for an hour and a half bus ride, do not choose the bus. Be in the moment, be awake, and be yourself. 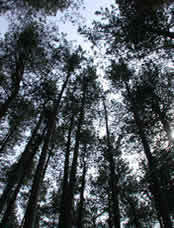 Self inquiry is asking yourself the question, "Who Am I?" When you get the answer, you will realize that the answer never ends. Green is a very nurturing color, and there sure is a lot of green lush nature at Gaia Sagrada!